This is a new printing of the original edition on sturdy, acid-free paper. 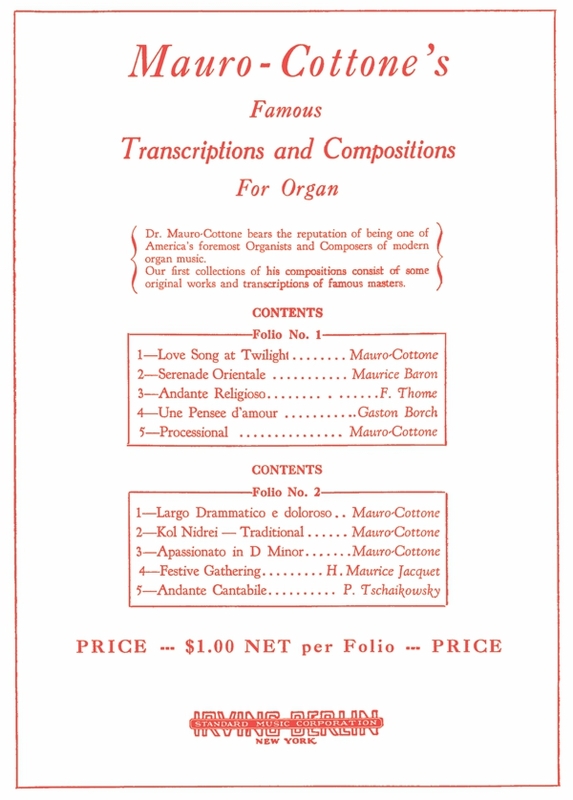 This set includes both volumes of Mauro-Cottone’s “Famous Compositions and Transcriptions for Organ, Theatre and Concert Use”: Folio 1 (red cover) and Folio 2 (blue cover). Folio 1 includes a photo and capsule biography, and Folio 2 includes additional photos and a list of his organ music. Highest quality guaranteed. Size of music is 9.5" x 12.5". Bought separately, $34.00 plus shipping. Bought together on this page, $30.00 ($4 savings). To see information on the individual volumes of this set, visit Folio 1 and Folio 2. Melchiorre Mauro-Cottone was born on December 12, 1885, in Palermo, (Sicily) Italy. He was the son of Antonio Mauro (1849–1922), who wasthe son of Melchiorre Mauro, an organist and composer, and Giovanna Cottone. When he was 13, he substituted as organist for his father at the Church of St Dominick in Palermo. After graduating with highest honors from the Royal Conservatory of Music in Palermo, Melchiorre was appointed assistant professor there at age 19 to work under his father, the professor of organ since 1896. When he was 20, he was appointed conductor of the Schola Cantorum Pius X. 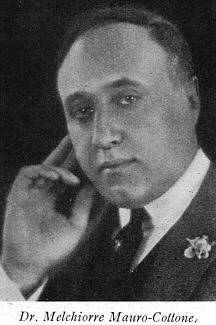 He married Rosa Varvaro in 1906, by whom he had two daughters, Gina (Mrs Frank Pisant) and Aurora Mauro-Cottone DeCaro (1911–2006), a concert pianist.